Altimeter, barometer, thermometer, chronograph and compass are something you cannot do without if you are going on an extreme expedition. Carrying all these essential devices can be a heavy burden on the back especially as traveling light is a prerequisite and not a luxury. As such, the latest Timex Expedition WS4 has not come in handier. The cool timepiece combines time-keeping with a timer, alarm, altimeter, barometer, thermometer, chronograph, and compass for the die-hard adventurer. Besides, you not only look cool in an elegant watch but travel in style as you don’t have to lug so many extra devices with you. All the information you need to aid you in your expedition is in your hands, or around your wrist, literally speaking. The wide-screen face of the watch, lightweight composite casing and stainless steel bezel make the watch very practical and user-friendly. Wearers can also choose between a rubber strap and an XL elastic strap for the watch. Available in black, orange, yellow, blue, and white, the watch is fashionably attractive and practical. 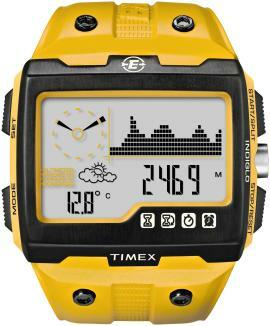 The Timex Expedition WS4 is available at $199 starting in May.